This sketch was taken from the Fall River Daily Globe, 25 Aug 1893, and it accompanied an article describing the Dedication of the new hall of the "Ancient Order of Foresters" in the city the previous evening. 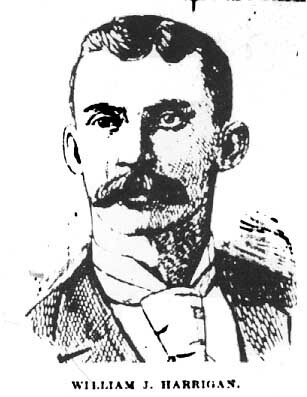 Mr. Harrigan was not further identified in the article, but his picture was printed near the top of the article. Other Fall Riverites of Irish heritage mentioned in the article as prominent members of the Foresters were John A. Crowley, W.H. Burke, Thomas Hayes, Michael Welch, John F. Quinn, M.P. Kelly, D.F. Sullivan, Henry Kane and Samuel B. Morris.